I made simple application for track life points during MTG match. This is web application, designed for ppc screen resoultion (240×320). I have tested (and using now) this application on Opera for Windows Mobile (v 8.60). 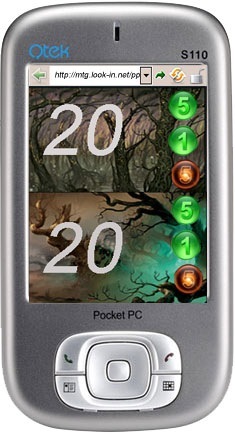 You can download this application (http://mtg.look-in.net/ppc/mtg_lifecounter_v1.0.zip) to you PPC, or use it from my server (http://mtg.look-in.net/ppc/counter.html).